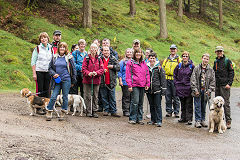 This group is a part of Greater Gwent Area. Islwyn Ramblers are based in Risca and have a great programme of weekend and midweek walks led by local experts to suit all abilities - from Light 'n Leisurely, strolling through our green-again valleys to our Mountain Goat Division, scaling those bracing Brecon Beacons. You’re very welcome to come walking with us, or to get involved in looking after paths and green spaces and opening up new places to explore. Join the Ramblers and become a member of Islwyn Group.